One of the United States’ newest dairy processing plants features advanced wastewater treatment technology that not only radically improves biomass recovery and effluent quality, but also harnesses green energy from waste streams to drive production processes and reduce its carbon footprint. The Cayuga Milk Ingredients (CMI) plant in Auburn, NY, will manufacture a wide range of dairy products, such as pasteurized cream, whole milk powder, liquid permeate, condensed milk, skim milk powder, non-fat dry milk, and milk proteins. Cayuga Marketing LLC, a collective of dairy farmers in the Finger Lakes Region, NY, decided to construct their local processing plant to reduce their milk-hauling costs while also greatly reducing transport emissions and carbon footprint as a result of the shorter transportation distances involved. To achieve optimum environmental and efficiency benefits, CMI further decided to implement an anaerobic treatment process for their wastewater treatment facility, seeking to simultaneously achieve the most environmentally effective, energy-efficient and cost-efficient solution. CMI selected Global Water & Energy (GW&E) as the engineering, procurement, and construction (EPC) contractor to design, build, and start up their new wastewater treatment facility, specified to achieve outstanding effluent discharge qualities while producing valuable biogas (methane) initially for future utilization and electricity production. GW&E is the U.S. branch of Global Water Engineering and results from a joint Venture with Western Water Constructors, Inc. GWE has completed successful waste-to-energy projects around the world, ranging from sugar cane and cassava to potato products, brewery products, and any wastewater stream with a biological waste content, says GWE engineer Natascha Janssens. The SUPERFLOT-BIOGAS is a dissolved biogas flotation (DBF) system developed by GWE and used for high-efficiency removal of anaerobic biomass from the effluent of an anaerobic treatment system. The anaerobic biomass is returned to the anaerobic system, thus increasing the sludge retention time. Such systems allow anaerobic reactors to be greatly reduced n size. In SUPERFLOT-BIOGAS systems such as that used by Cayuga, the biomass is separated by means of flotation. Solids are forced to float by fine biogas bubbles attached to these solids. These fine gas bubbles are created by recycling clean effluent, in which biogas is dissolved under pressure. After injection into the lower part of the flotation tank, the pressure release results in formation of fine biogas bubbles. Since biogas is used instead of air, the system has a completely enclosed design. The Cayuga plant is designed to treat 950 m3/d of wastewater and 95 m3/d of whitewater, together resulting in a total COD (contained oxygen deficit effluent pollution) load of 6,000 kg/d. Approximately 80 percent of the COD load and 85 percent of the BOD (biological oxygen demand) load and is removed in the FLOTAMET system, with the waste removed converted to biogas. This results in the production of up to 1,900 Nm³/d (at 75 percent CH4) of biogas, with an energy content of 590 kW. Janssens says the biogas will be used partially to heat up the wastewater in order to ensure optimal anaerobic digestion. As such, the anaerobic treatment plant does not create an additional energy demand to the factory for heating purposes. In a second phase it is the intended to use the remaining biogas to generate electricity in order to meet CMI’s goal to further decrease the carbon footprint of the factory. The anaerobic effluent from the FLOTAMET system is treated in a conventional aerobic treatment by GW&E followed by a Dissolved Air Flotation (DAF) for solids separation. The aerobic polishing of the anaerobic effluent ensures that the discharge from the plant to the local sewer will meet the strict discharge limits applying. Anaerobic digestion facilities have been recognized by the United Nations development program as one of the most useful decentralized sources of energy supply because they are less capital-intensive than are large power plants. Modern anaerobic processes vastly concentrate the process in environmentally harmonious closed reactors, operated under ideal temperature and process control to optimize waste degradation and, in the process, generate large quantities of methane (CH4) from the organic materials in the wastewater. Savings quickly repay the cost of anaerobic plant – typically within two years – while achieving permanent environmental benefits by replacing fossil fuel, says the Chairman and CEO of GWE, Jean Pierre Ombregt. Anaerobic plants can also benefit local communities by providing local energy supplies while eliminating the need for large and often smelly and environmentally challenging aerobic and anaerobic lagoons commonly used outside the U.S.
For further information globally, please contact Marc Eeckhaut, Executive Vice President, Marketing and Technology, Global Water engineering, mail@globalwe.com. 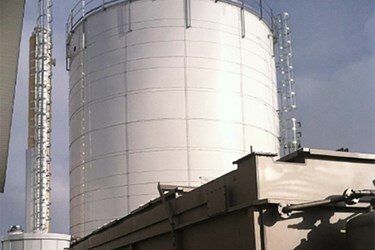 Addresses/contacts of the nearest GWE office are located at www.globalwaterengineering.com.